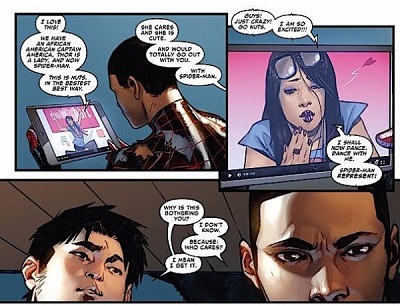 At the tail end of the recent Spider-Man issue 2, Miles Morales, having just won a bout with a demon, is watching a video of a YouTube star who, commenting on images from the battle, expresses her joy about the fact that he's "brown". While his ever excited pal Ganke suggests that he should just be happy that a cute girl is excited about him, Miles isn't pleased by her focus on his race. "I don't want to be black Spider-Man," he says. "I just want to be Spider-Man." He comments in an earlier panel, "Who cares?" If recent history has taught us anything, the answer is a lot of people. Whether you're talking a black Heimdall in the Marvel movies or a female Thor, there's no lack for examples of comic fans getting really freaking upset over issues of gender and race. 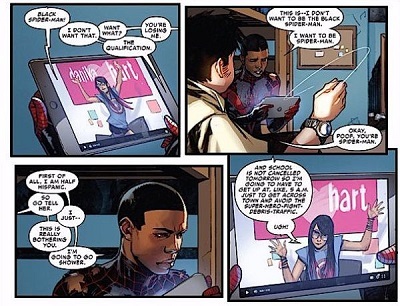 Miles Morales himself was a lightning rod for controversy, driving many longtime Spider-fans to the point of outrage over what they saw as a pointless and pandering change. And if I'm being totally honest, I can understand that one at least a little bit. I wasn't among those who were slobbering mad over the idea of a non-pasty white kid Spider-Man. 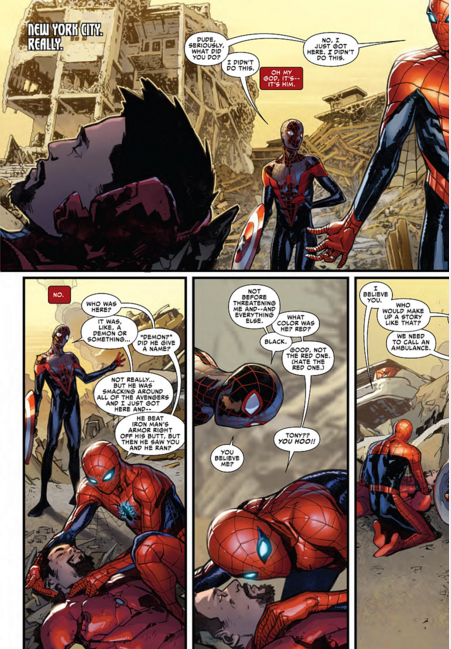 When Marvel announced that it would be killing the Ultimate Universe's Peter Parker though, it ticked me off. Ultimate Spider-Man was one of the books that converted me from an occasional comics reader into an all-in comics nerd. I was deeply invested in his story and seeing him get killed off to make way for a new character no one cared about stung something fierce. It didn't help that his death felt incredibly shoehorned in. I was looking back at my Ultimate Spider-Man trades the other day and Peter Parker had a lot going on when he died. He was in the middle of "superhero training" and had plenty of material in motion to keep his story going for awhile. The move to kill him felt, and continues to feel to me, like something decided by a board room. 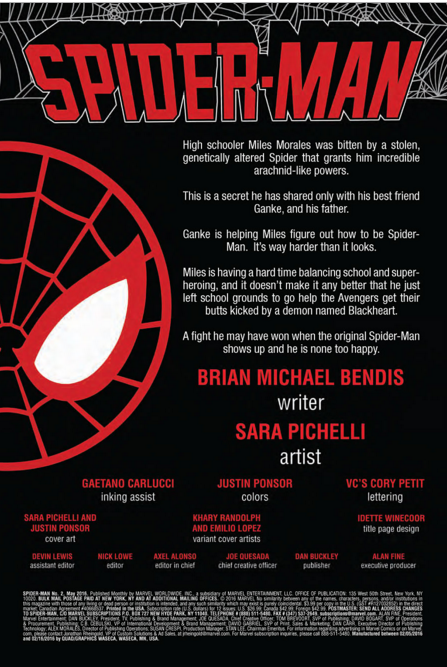 Whatever the end goal Marvel and Brian Michael Bendis had in mind, whether it was diversity or just drumming up comic sales, it was one they pulled off clumsily. The thing is, a lot of fans weren't angry for those reasons. They were angry solely because they didn't want Spider-Man to be black. It likewise didn't matter that Idriss Elba was a fantastic actor or that the origins of female Thor were well devised when the comic actually released. Many angry readers and pundits rejected them based solely on their perception that Marvel was altering classic characters to pander to recent trends of political correctness. And this is where we reach the "who cares?" point of the conversation. 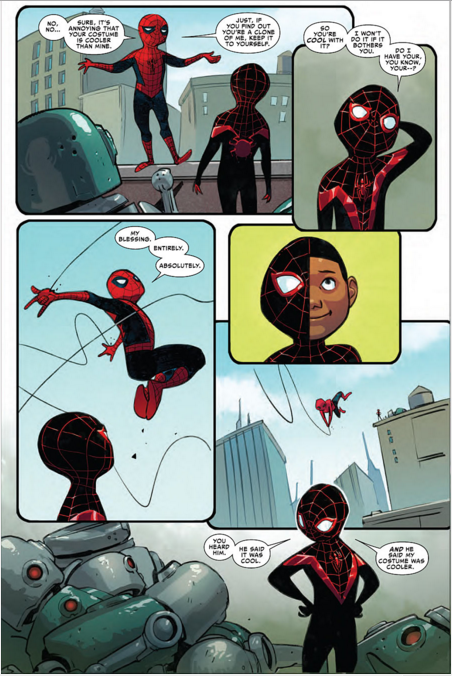 I don't complain much about Miles Morales replacing Peter Parker anymore because, while Marvel might have fumbled the execution, he wound up being a fantastic addition to the company's cast. 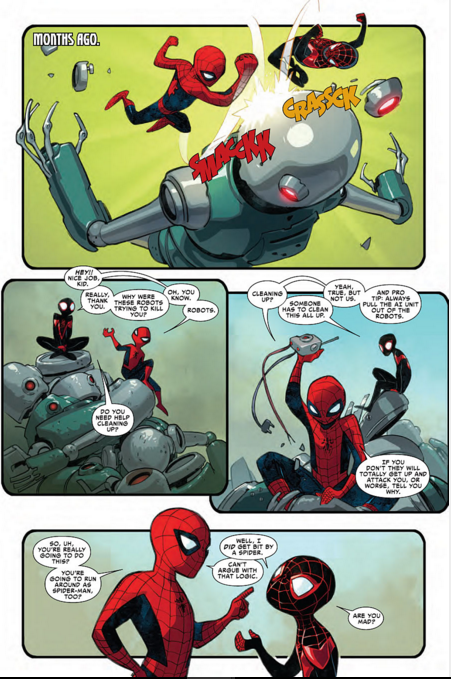 His adventures reinvigorated Spider-Man in a way that Peter Parker stories haven't been able to in a long time. Likewise with Thor. I love classic Thor and writer Jason Aaron was knocking it out of park with the character well before female Thor debuted. Even so, I'd be lying if I said that old Thor was as interesting a character as the female version. She's more complex and the backstory that drives her is relate-able and grounded in a way that old Thor's wasn't. The series has benefited tremendously from the gender switch. Now, to be fair, when Miles Morales says "who cares?" he's saying it about someone who actually supports the idea of a black Spider-Man. And yes, while representation is important, it should be said that swapping their skin color or a gender doesn't automatically make a superhero better. Even so, Morales, with that line, is expressing the essential truth that his skin color shouldn't overshadow his deeds. It's ultimately the quality of a hero (or comic book) that matters the most. 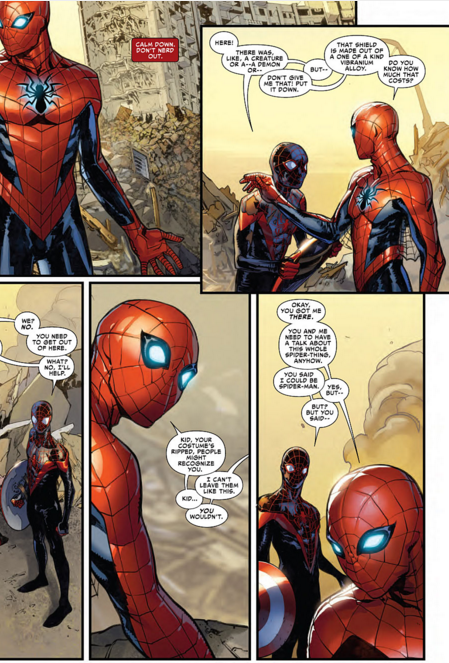 The perhaps more important question that Spider-Man #2 doesn't ask is "why do you care?" If you're upset because you like certain characters and prefer them to stick to a certain status quo, I can sympathize with that. We all have our preferences and we've all, at some point, been burned by bad writing that ruined a good thing. If the problem though, is that you just can't bear the thought of someone with different parts swinging a hammer or different skin wearing a mask, well, the most I can offer you is the hope that you'll get over it before you miss out on some really good comics. Stew Shearer is a newswriter and contributor for The Escapist. Please follow him on Twitter! Remember to check out The Escapist's other comic book columns: Speeding Bullets, The Panelist, and Gutter Mouth!